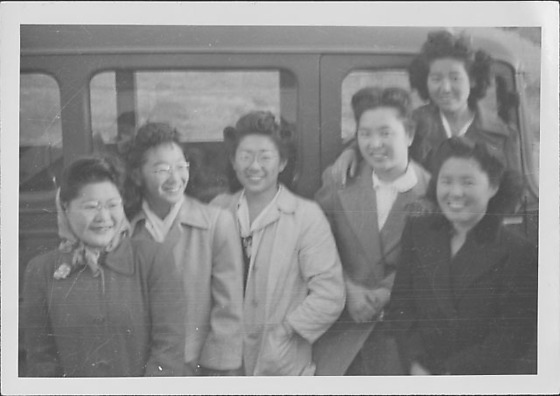 Portrait of six smiling women in coats standing in front of a large vehicle at Rohwer concentration camp, Rohwer, Arkansas, 1942-1945. Three women at L wear glasses; woman at far L wears headkerchief tied over her head. Young woman at TR appears to be standing on runningboard as she wraps her proper R arm around the shoulders of taller woman next to her. Image is blurry and appears to have been printed from damaged or very poor quality negative.